It's official, the Bounce News app has over one million users across platforms and still counting. Not only has it notched one million downloads but has also done so in grand style by achieving some epic milestones like industry rankings and awards, all in its first year of launch. It also became the first pan-Nigeria news app to hit one million downloads. Bounce News Nigeria launched March 1, 2017 as Nigeria’s first online news aggregator guided by Artificial Intelligence and Machine Learning. The app ensures that news and other content are delivered to users based on their preferences and content consumption pattern. In other words, you get only what matters to you, how you want it and whenever you want it. However, the key to the amazing successes are the Bounce News readers and protagonists fondly called Bounce People. They are everyday Nigerians across the cities and villages who have grown to trust the brand and are always happy to tell their stories. With a team of seasoned multimedia journalists in a contemporary newsroom, Bounce News changed the language of news to that which everyone understands and ensures everyone is heard. “We tell stories of the people’s hustles, victories, losses and hope for a better life and a better society. Surely, this is why the legion of Bounce News readers and app users continue to grow across Nigeria,” the team proudly says. This has also resulted in massive traffic as Bounce News has now hit an average of 700,000 page views daily. The General Manager, Goodluck Ikporo described the feat as a validation of the Bounce style of writing which aims to tell real stories in an entertaining way and the team's commitment to ethical values. In addition to the over one million app users and massive traffic, Bounce News has also built an amazing community of about three million engaged followers across social media platforms. The massive followership helps ensure content resonates with the people, especially the millennials whose voices are louder than ever. The brand has remained true to its promise to deliver content that gives you an edge because of its timeliness, simplicity, accuracy and of course tailored relevance. 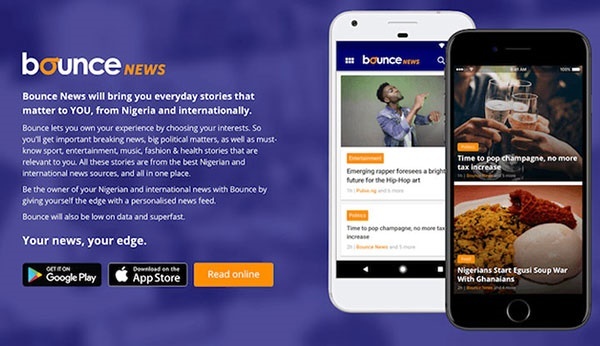 The latest of its promises is the ongoing #BounceAwoof promo which is open to all old and new users of the Bounce News app. More persons will win smartphones, goody bags and other fabulous prizes including an all-expense paid trip for four people to London and Dubai.